Whether it’s your turn to have the family over for New Years Eve, you’re moving home, or you’re just sick of living around such a mess, decluttering is a necessity every now and then. Although you know it needs to be done, you may find it a little hard to get started, whether out of laziness or an instinctive attachment to your stuff in general. To help you out, here are some no-brainer items you can get rid of in no time. Countless people just like you find themselves in situations where they’ve needed to run out and buy some practical item, used it once, and then let it gather dust for years on end. Specialist DIY tools are probably the most common culprit. When you come across these kinds of items, it’s easy to leave them be, assuming that it must be there for a good reason. Think about it though. When you’re trying to declutter and come across practical items, spend some time thinking about whether or not you’re going to have any use for it in the future. It could be taking up valuable space! If you’re as disorganized as I was at one point, then there’s a fair chance that you’ve got what I call “disguised junk” lying around your home. Sometimes, when we let the general clutter in our homes get out of hand, it can be easy for piles of junk to accumulate, and become disguised in the surrounding chaos of our homes. Make sure you’re bearing this possibility in mind when you’re having your big de-clutter, and throwing out anything that really shouldn’t be in your home a moment longer. It’s pretty common for some households to have one big piece of junk lying around which is simply too inconvenient for them to shift themselves. It may seem like a hassle, but now’s a good a time than ever to get rid of your big pieces of trash. To make things easier for yourself, you can hire a junk removal service such as Bay Wide Hauling. Once you really get stuck into a thorough decluttering session, you’re sure to find various duplicates here and there. I’m talking about any items which you went out to buy when you simply didn’t have the time to look for the one you already had! Again, tools and utensils are usually a big culprit in this category. Unless it would be a total emergency if you didn’t have a spare, it’s probably not going to be necessary to keep both of these items. Think about how urgently you’d need a replacement. If it wouldn’t be that much of a big deal, hold onto the item that’s in a better condition, and throw away (or donate if appropriate) the one that’s a little worse for wear. Decluttering a house that’s gotten out of control can be tough work. However, finding and getting rid of these items will get you off to a great start! 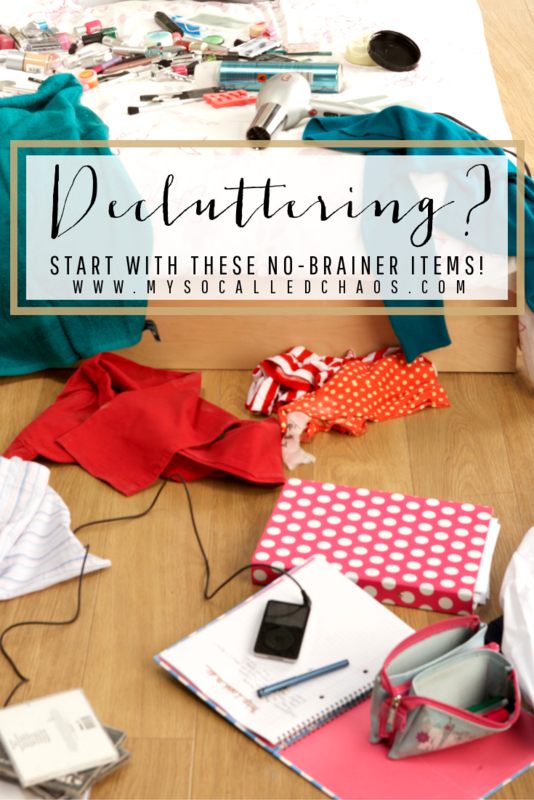 Are you working on decluttering? I definitely need to get this done pronto… Any tips you’d like to share? Leave them in the comments! This post contains an affiliate link or two, thanks so much for supporting my blog.